Arizona Field Ornithologists offer financial support to individuals for the purpose of conducting field research that will enhance our knowledge of the status, distribution, identification, and other aspects of Arizona birdlife. 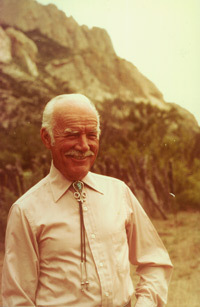 Gale W. Monson (1912-2012), considered to be the father of modern Arizona field ornithology, was best known as one of the authors of Birds of Arizona (1964) and the Annotated Checklist of the Birds of Arizona (1981), as well as editor of the Southwest Region for American Birds from 1948 until 1963 and again from 1971 to 1973. His interest in birds began when he was a boy in Red River Valley, North Dakota. He moved to Arizona in 1934 where he worked until 1940 as a biologist on Papago (now Tohono O’Odham) and Navajo tribal lands, as well as for the Soil Conservation Service in Arizona and New Mexico. 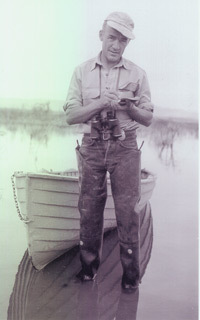 In 1940 until 1969 (except for two and a half years in the army stationed in China, Burma, and India from 1942 to 1945) he worked for the U. S. Fish and Wildlife Service at refuges in New Mexico, at Havasu and Imperial National Wildlife Refuges on the Colorado River, and on the Kofa and Cabeza Prieta Game Ranges. During this time he authored several articles on the status of birds along the lower Colorado River and elsewhere in Arizona which were published in the Auk and Condor. In 1971 he became one of the supervisors of the Arizona-Sonora Desert Museum in Tucson. Along with Dr. Stephen Russell, Monson conducted the field research for and wrote The Birds of Sonora (1998). Always the consummate field man and a meticulous documenter of birds, plants, and other wildlife, Gale was dedicated to the betterment of Arizona and Sonora’s many biological treasures. During the 1970s and '80s, Gale was persistent in contacting birders to solicit photos of rare birds and he maintained the photo file in the University of Arizona Bird Collection. Thanks to him, many rare species were documented during that time. In the late 1990s Gale moved from Tucson to Albuquerque to be closer to his family, where he continued to enjoy birding and reading the journals he kept for more than 80 years. Gale W. Monson, born August 1, 1912, passed away peacefully at his Albuquerque home on February 19, 2012. TO APPLY: Grants will be awarded based on scientific merit, level of preparation, and financial need. Grant recipients are required to make an oral presentation on their findings at an annual AZFO statewide meeting. Recipients are also strongly encouraged to prepare a manuscript reporting their results and to submit this manuscript for publication, preferentially to the Arizona Birds online journal. Project proponents must complete an application that includes a maximum two-page description of the project, a statement of how the project will enhance our knowledge of avian life in Arizona, and the amount of grant money being requested. Also required is information on how the award money will be expended and whether other sources of funding for the proposed work are available. The application package must include a letter of recommendation describing the applicant's qualifications and commitment to Arizona ornithology. Students and nonstudents are welcome to apply. The application deadline is August 1, 2019 and funding decisions will be made by September 1, 2019. Applications can be for any amount up to $1,000. A maximum of $2,000 is available for grants in 2019. Two-thirds of the funds will be awarded immediately after approval of the project, and the remainder will be provided after confirmation that a presentation will be made at an annual statewide meeting. Grant recipients are required to provide a progress report on their research project within six months of receiving an award. Nick Beauregard: Investigating Yellow-billed Cuckoo Breeding and Distribution in Southeastern Arizona. Kevin Clark: A Survey of Rancho Carrizo, Sonora, Mexico for Masked Bobwhite. Ruby Hammond: Characteristics of Live Ponderosa Pines and Use by Woodpeckers and Wood Boring Insects. Eamon Harrity: Juvenile Dispersal of the Yuma Ridgway’s Rail. Kerrie Anne Loyd: Movement, Behavior and Conservation of Western Burrowing Owls in a Suburban Desert Landscape. Tuul Sepp: Urbanization Effects on Life History of Arizona House Finches. Ariana La Porte: Gray Hawk Expansion on the San Pedro River: Density Dependence, Habitat, and Diet. Ariana La Porte: “Water, Land Use, and Gray Hawk Ecology along the San Pedro River.” Full abstract here. Zachary Smith: "Spring raptor migration monitoring from the Sierra Prieta Overlook, Prescott National Forest: A pilot study". Full abstract here. David Vander Pluym: "Bird migration at Lake Havasu". Full abstract here. Chris McCreedy: "Plumage dfferences and wntering dstributions of Sagebrush and Bell’s Sparrows in California and Arizona". Full abstract here. John Arnett: “Non-breeding season occupancy of Gray Vireos at Kofa NWR, Arizona”. Full abstract here. Michael Lester: “The effects of chronic contaminant exposure on the immune system and body condition of birds in the upper Santa Cruz watershed, Arizona”. Full abstract here. Kristen Dillon (University of Arizona): “Ecological Causes of Elevational Gradients in Clutch Size of Red-faced Warblers”. Full abstract here. Carl Lundblad (University of Arizona): “Ecological Correlates of Altitudinal Migratory Tendency in Yellow-eyed Juncos”. Full abstract here.